New payment scheme also represents a 42% increase in the payout to shareholders. Along with its first-quarter earnings results, oil and gas specialist Adams Resources & Energy (NYSEMKT:AE) announced yesterday it would initiate paying a quarterly dividend of $0.22 per share, replacing its previous policy of making payouts annually. The board of directors said the quarterly dividend is payable on June 17 to the holders of record at the close of business on June 3. Adams Resources has paid a dividend every year since at least 1999, and has regularly increased the payout over that time period. The new quarterly payout would amount to a 42% hike from last year's dividend payment of $0.64 per share. 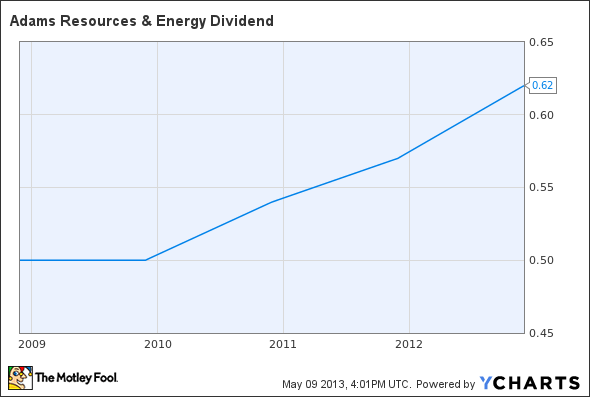 The regular dividend payment equates to an $0.88-per-share annual dividend, yielding 1.8% based on the closing price of Adams Resources & Energy's stock on May 8.